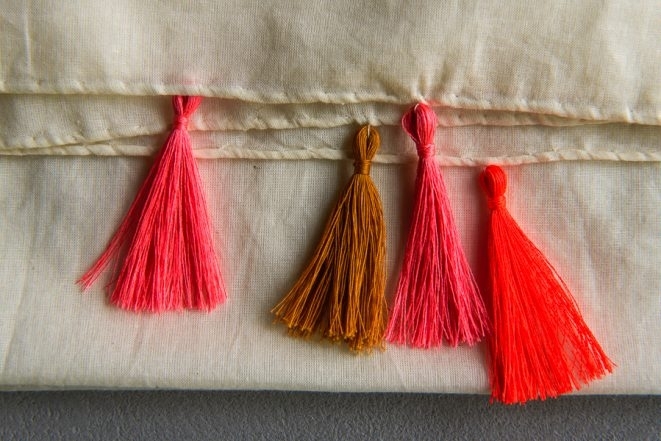 Our latest crafting obsession: tassels! 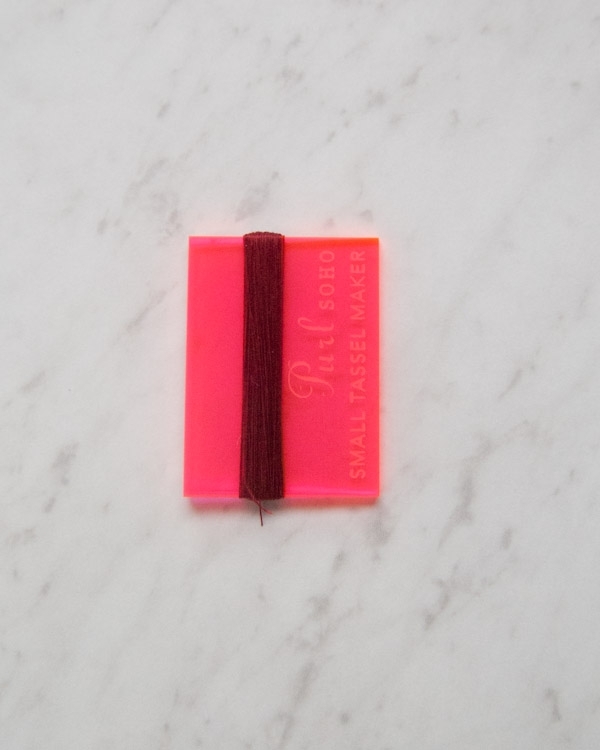 These sweeties add vibrancy and charm to whatever you’re making, along an edge or at the corners. 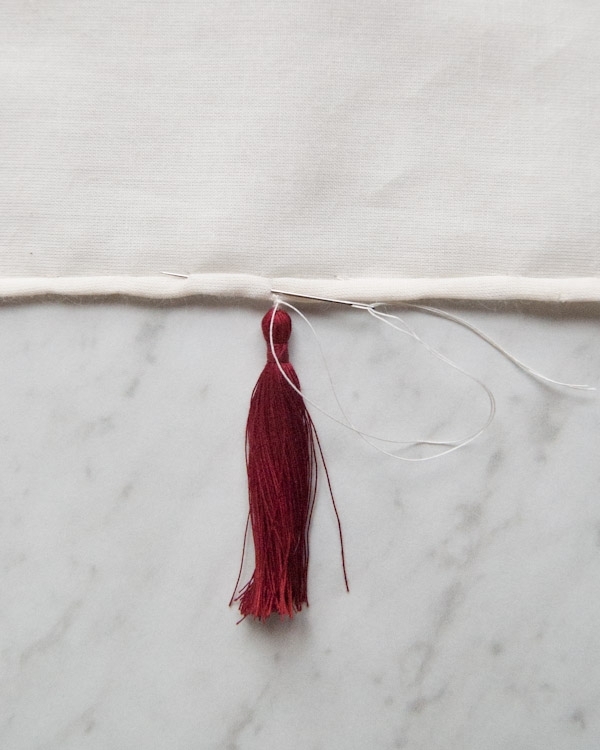 And tassels are so easy to whip up, especially with our handy Tassel Maker. Just wrap, tie, and snip, and you get a perfect little plume! 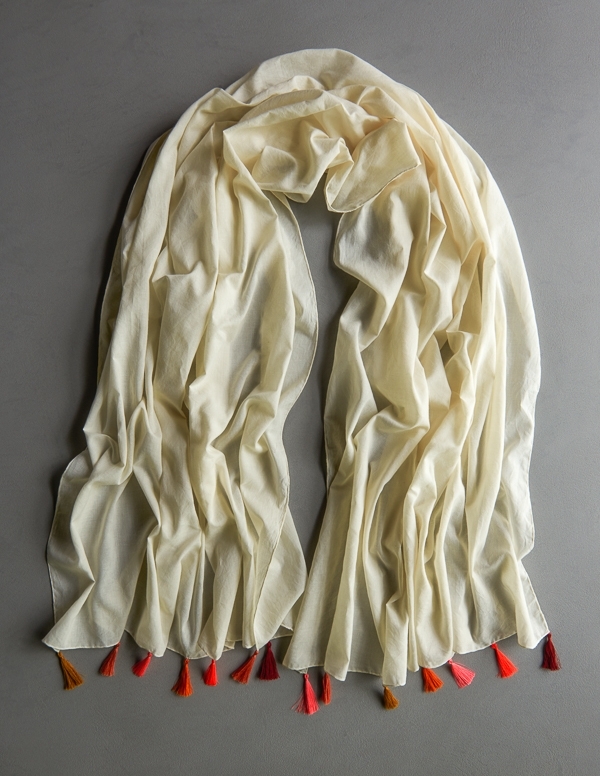 Our Rolled Hem Tassel Wrap is a finished rectangle of Robert Kaufman’s Organic Voile, decorated at each end with pretty tassels. 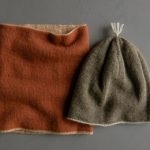 To make them, we used a Sewing Thread Bundle in our toasty Campfire palette. 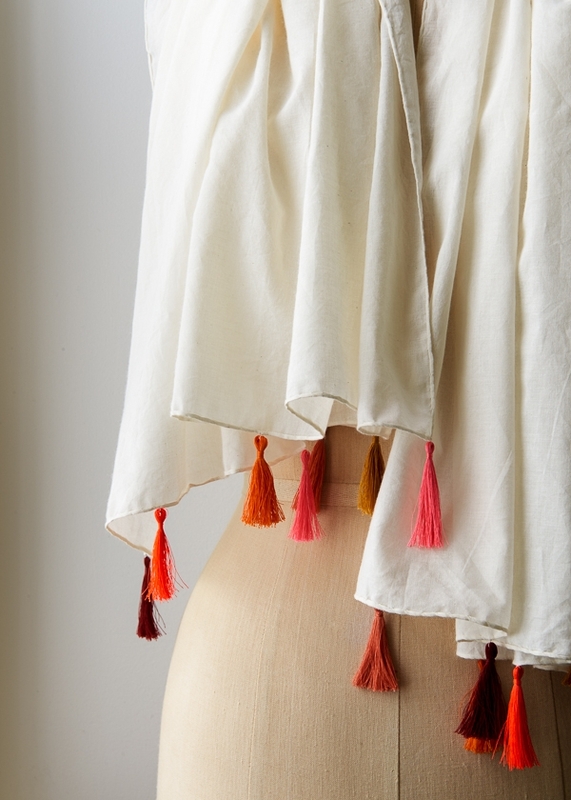 Against the creamy Voile, these little tassels really add spark! Since this fabric doesn’t have a clear right and wrong side, you should just assign the sides arbitrarily. Making sure to first trim off both selvage edges, cut the fabric into a 36 1/2 by 72-inch rectangle. Using the technique explained in our Rolled Hem Edge Tutorial, hem all four sides of the fabric with a rolled edge. 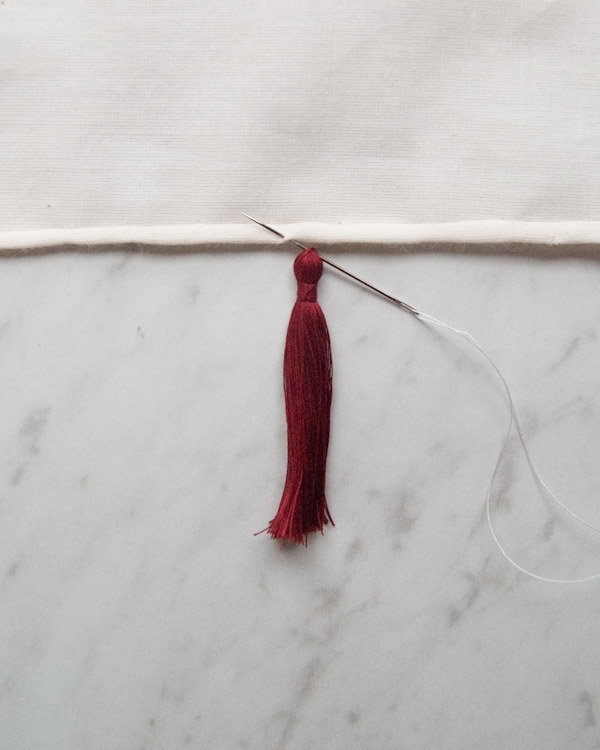 With the Sewing Thread and hand-sewing needle, hem the long sides of the rectangle first and then the two shorter sides. Cut the thread at the bottom of the Tassel Maker. 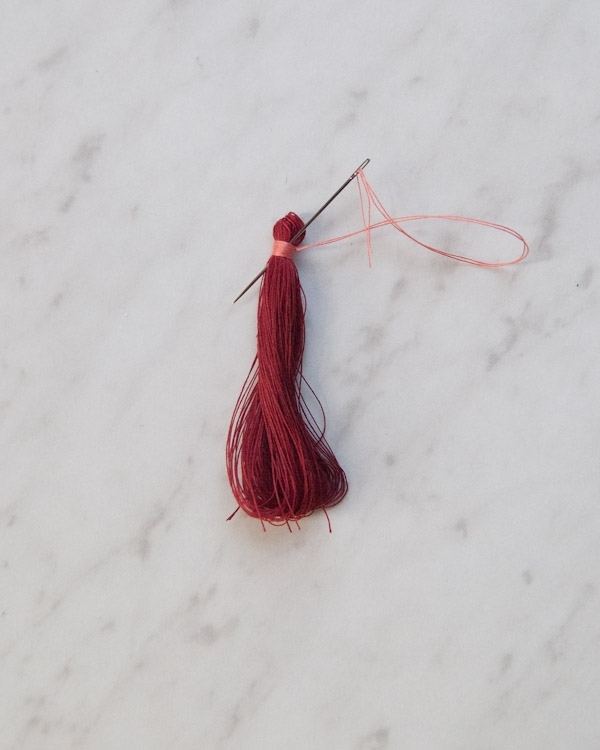 Cut an 18-inch length of the Tassel Thread and thread it onto the needle. Pass the needle under all the wound threads. Pull the needle until the middle of the thread length is under the wound threads. 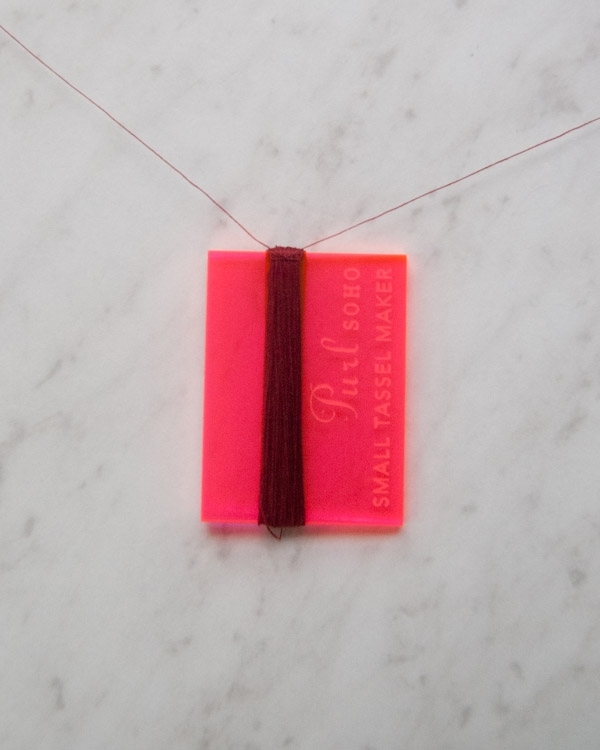 Tie a square knot at the top of the Tassel Maker, securing the wound threads. 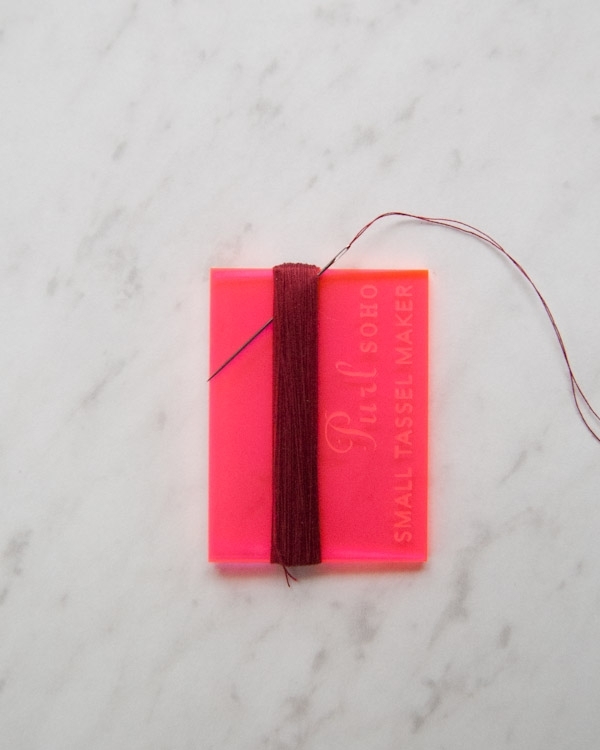 Gently pull the wound threads off the Tassel Maker and remove the needle. Trim the ends of the thread that tied the square knot so they roughly align with the bottom of the loops. Pinch the top of the thread loops, as well as the tail-end of the Tie Thread. 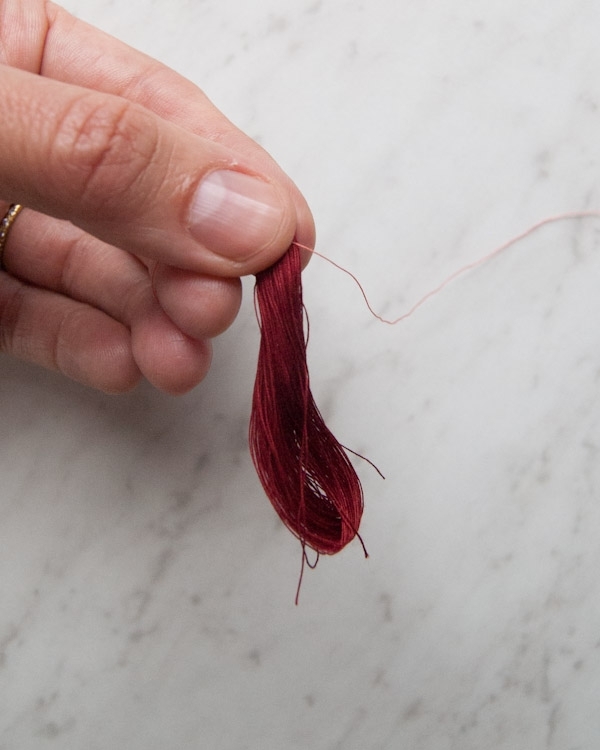 Keeping your pinch tight, wrap the Tie Thread 20 times tightly around the pinched loop, a scant ¼-inch below its top. Tie the two Tie Thread ends together in a tight square knot, securing these wraps. 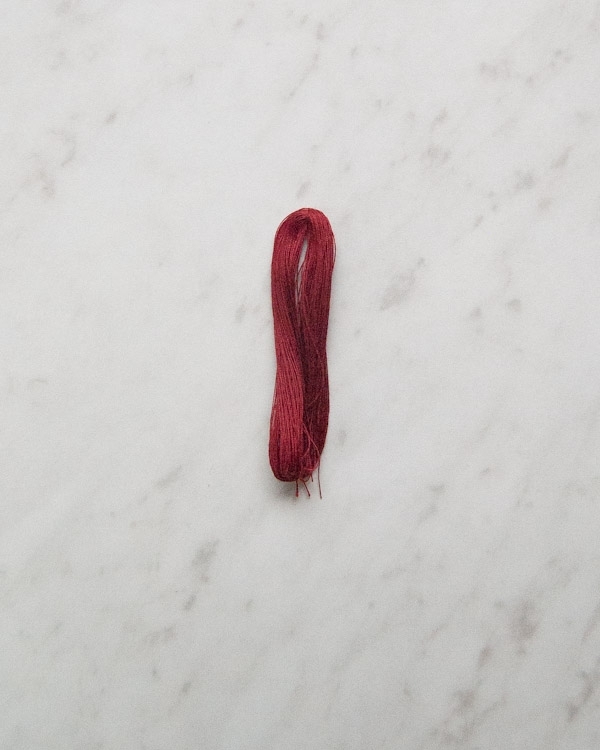 Snip the Tie Thread’s tails so they are the same length and thread them both through the needle as if they were one thread. Then push the needle down through the center of the wraps and pull taut. 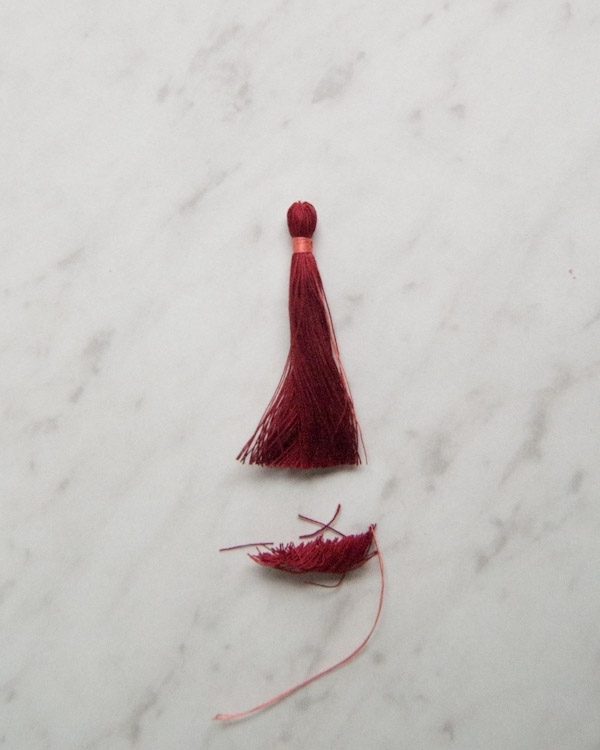 Smooth down all the loops and tails and snip off their ends to create a tassel. 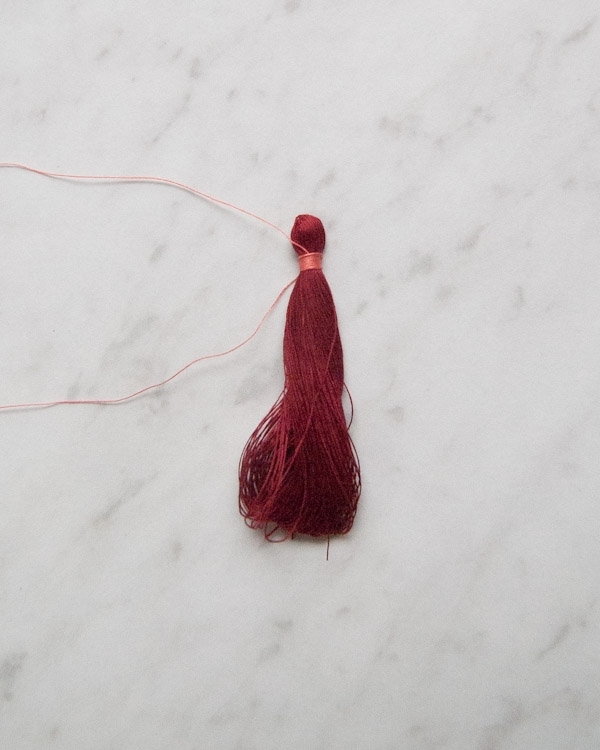 Make 13 more tassels like this one, using all six of the Tassel Thread colors. 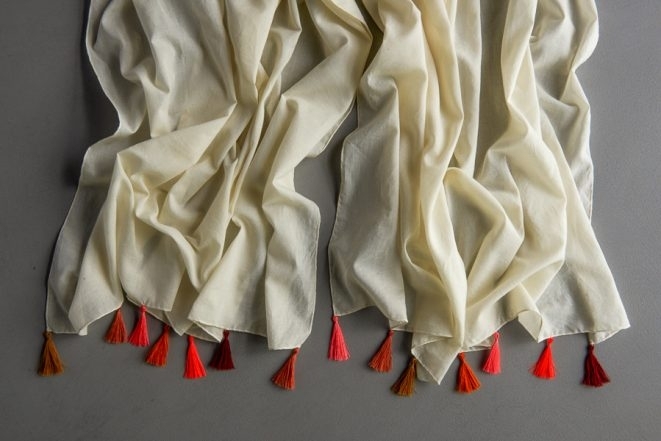 From four of the colors, make two tassels of each; and from two of the colors make three tassels each, for a total of 14 tassels. 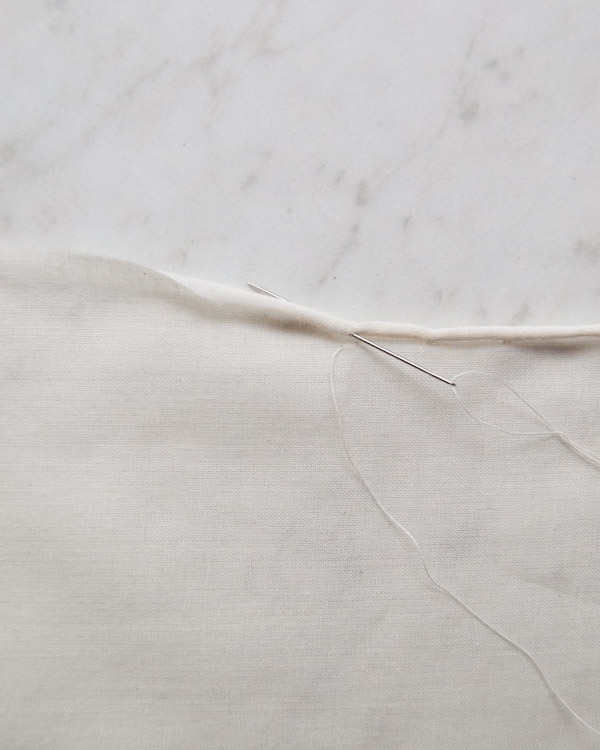 Cut an 18-inch length of the Sewing Thread and thread it onto the hand-sewing needle. 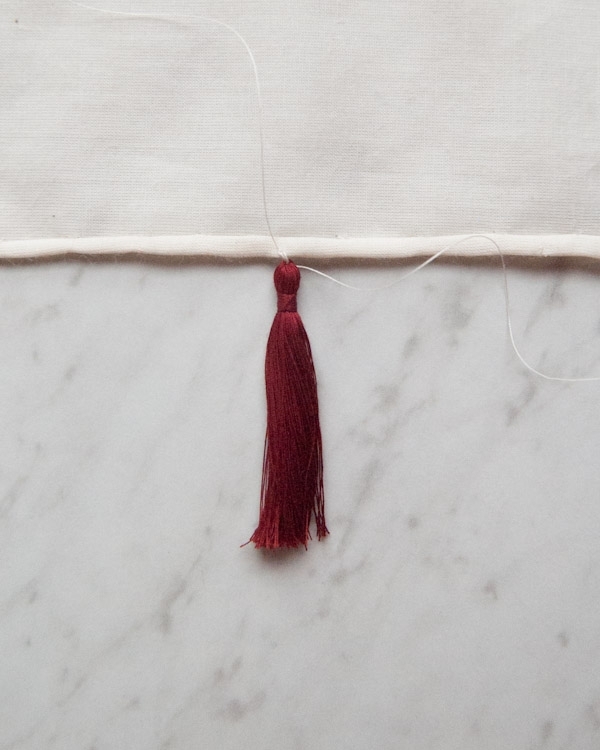 Leaving a 4-inch tail, sew through the tassel very top threads, then through the very bottom of the rolled edge of the wrap. Repeat this stitch a couple of more times at the same point. These are the Tacking Stitches. Wrap the needle-end of the Sewing Thread around these Tacking Stitches three times and then tie the Sewing Thread’s two tails in a square knot. Thread the other Sewing Thread tail into the needle together with the first, as if they were one thread. Enter the needle at the hem’s Tacking Stitches and pull the needle through the hem, exiting approximately 1 inch away. Trim the threads at the exit point to hide their ends. 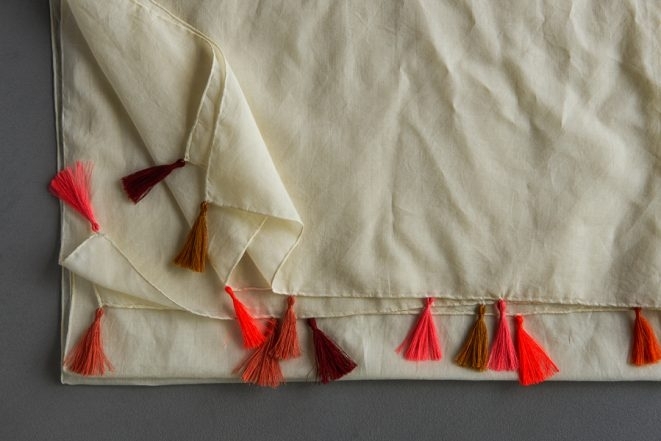 Repeat these steps to sew on all 14 tassels. 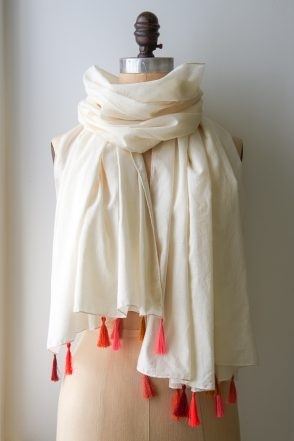 Using a garment steamer or the steam option on your iron, steam a tassel. Once it is moist from the steam, comb it out and straighten all the strands with a knitting needle or any other pointy object. Then, smooth out the tassel with your fingers. Repeat for all 14 tassels and you will be all done! How do you recommend I wash a garment with these lovely, fine tassels? Will gentle hand washing keep them from getting hopelessly tangled? Thanks for writing in! This piece should be hand washed only. If you soak it in a gentle cleanser like Soak and make sure to hang it dry with the tassels hanging straight down it will actually help the tassels look fresh! Gorgeous. This concept would work well with a variety of fabrics. I’m thinking of a light wool plaid with tassels in yarn and a machine-made hem. 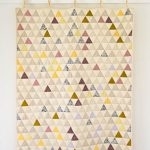 This non-knitter is so happy to see again a project that calls for sewing! I am so eager to make one of these on-trend wraps! 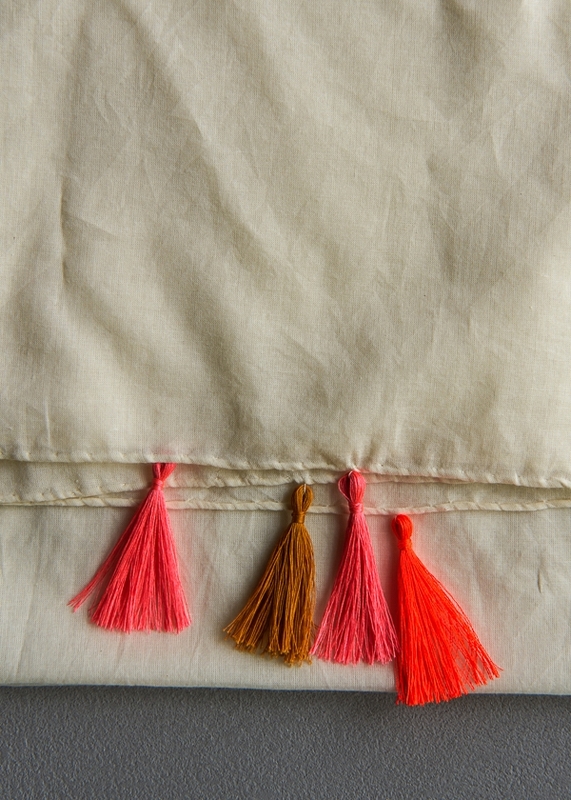 And I love tassels — can’t wait to try making them! 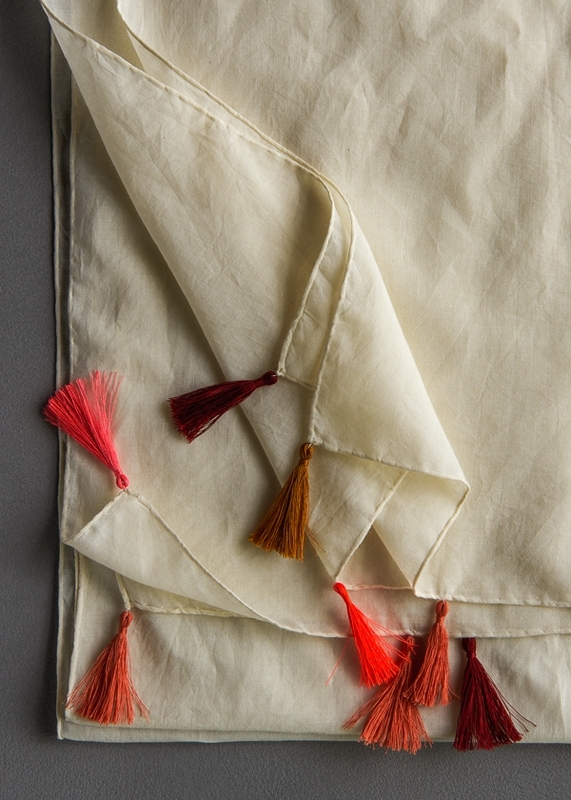 One question, purl soho — washing a garment with tassels? As all materials are cotton, it seems as though machine washing is safe. Except for the tassels!! I imagine they will curl up and look awful. Have you washed the template? This piece should be hand washed only. 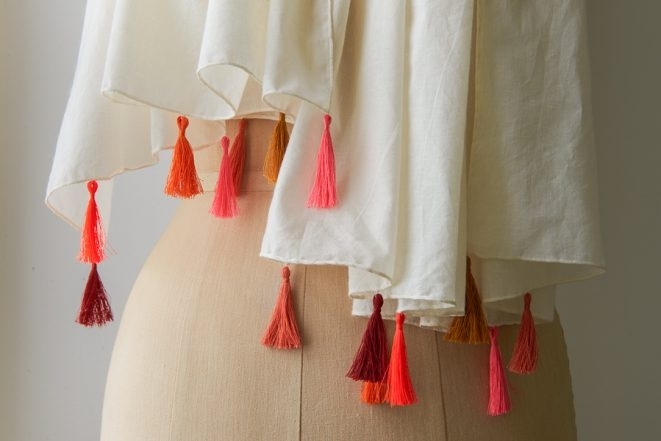 If you soak it in a gentle cleanser like “Soak” ( https://www.purlsoho.com/soak-3-ounces.html ) and make sure to hang it dry with the tassels hanging straight down it will actually help the tassels look fresh! Thanks for your question and let us know if you have any more. 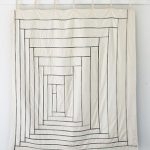 hi – this voile looks lighter than natural…was it one of the white voiles? I am thinking of making them for my daughter’s wedding party and she has a theme of a conch shell for colors. 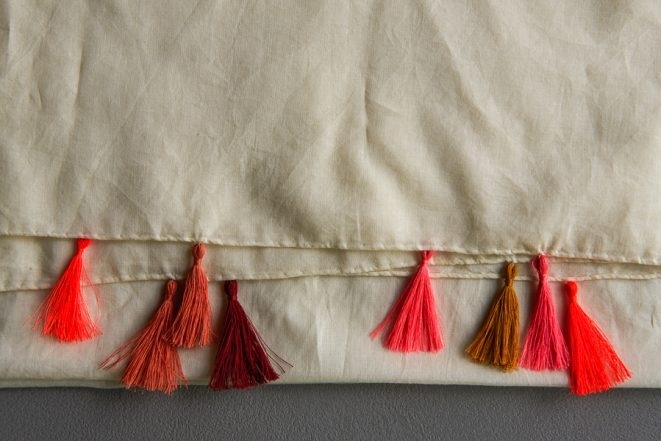 Any recommendations on the thread combination for the tassles? Thanks…oh and I’ve never sewn…this looks like all handsewing, right?! Congratulations! 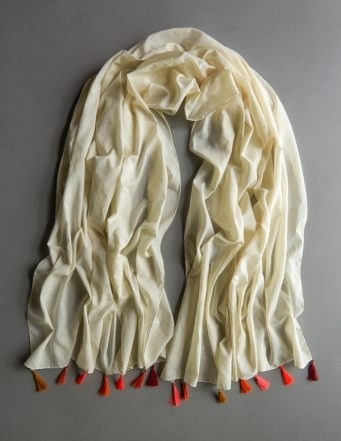 These would make such lovely wraps for a wedding! You are correct, these are sewn by hand and very achievable by a new sewer. We did use the natural colored voile. It is actually quite subtle in real life. The white can be quite stark, which works well for a more intense contrast but the natural that we used here creates a more subtle piece. Given the color scheme of conch shells, I think that either the Candle Light or Lavender Tea colorway of the sewing thread bundle could work very well. Love this wrap! Want to try one for New Year’s Eve in something sparkly! Thank you for your kind words! I’m so happy to hear you are inspired. Inspiration is what we aim for. I bought the wool wrap with silk tassels kit. There aren’t any directions (that I can find). Should I follow these? This is a beautiful scarf but my handstitching is awful. Would it be possible to use a rolled hemming foot or is the material too fine? I understand that it would not have the same “made with love” appearance. Thanks for writing in! This fabric is on the finer side for a rolled hem foot. You would try placing a small piece of tissue paper under the presser foot. This is a way to help make working with lighter fabrics and a rolled hem foot less cumbersome. That said, I am not able to speak from personal experience with this foot and fabric combination. I’d suggest giving it a try on a small piece before tackling the whole project! Beautiful & simple. However, it is large. I’m 5’ and 125 lbs. what size rectangle would you recommend? Most patterns are too large – too wide, too long. Please advise asap. I would like to make it as a Christmas gift. Thanks for writing in! The best way to determine the correct size to knit is to measure your full bust and compare it to our sizing chart. The smallest size, 34 1/2, will fit a 30 to 33 inch bust, and is shown on a model with a 31 1/2 inch bust. 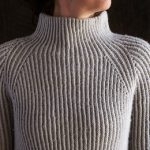 Shortening this sweater is quite straightforward – the first step in the pattern is to knit the body from the hem to the armhole, so you can simply stop knitting when you reach your desired length and begin the armhole. Since the sleeves are knit from the top down, you can try them on as you go and begin the cuff 4 inches before they are long enough.